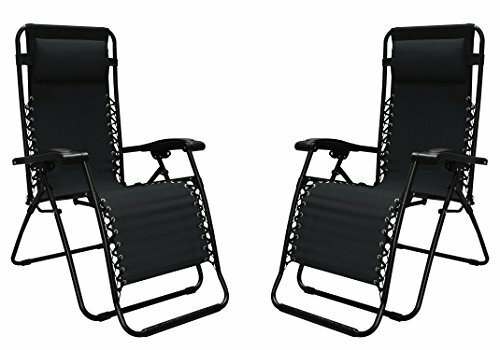 Caravan Infinity Zero Gravity Chair Set!! Great Deal!! Color: Black, supports up to 300 lbs. Caravan Sports Infinity zero gravity chair 2 Pack offers the ultimate portable comfort times 2! each chair features our new & improved locking system that allows you to lock the chair in any position & the adjustable headrest is provided for additional comfort or use as lumbar support. The Infinity zero gravity chair folds neatly & is easy to transport to the beach, barbeque or a game. Sit back & rest easy as this chair takes comfort to a new level. Perfect for backyard, beach, or sporting event. Folded dimensions (each chair): 38.6" length x 26.4" width x 6.3" high. Open dimensions (each chair): 25.5" length x 45" width x 64.5" high. Each chair supports up to 300 lbs.